We’d love your help. Let us know what’s wrong with this preview of Why We Snap by R. Douglas Fields. 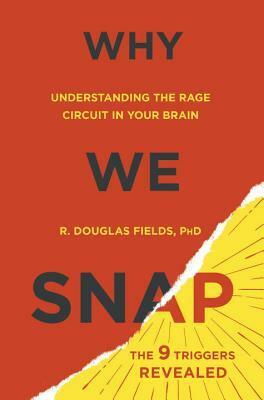 We all have a rage circuit we can’t fully control once it is engaged as R. Douglas Fields, PhD, reveals in this essential book for our time. The daily headlines are filled with examples of otherwise rational people with no history of violence or mental illness suddenly snapping in a domestic dispute, an altercation with police, or road rage attack. We all wish to believe that we are in control of our actions, but the fact is, in certain circumstances we are not. The sad truth is that the right trigger in the right circumstance can unleash a fit of rage in almost anyone. But there is a twist: Essentially the same pathway in the brain that can result in a violent outburst can also enable us to act heroically and altruistically before our conscious brain knows what we are doing. Think of the stranger who dives into a frigid winter lake to save a drowning child. Dr. Fields is an internationally recognized neurobiologist and authority on the brain and the cellular mechanisms of memory. He has spent years trying to understand the biological basis of rage and anomalous violence, and he has concluded that our culture’s understanding of the problem is based on an erroneous assumption: that rage attacks are the product of morally or mentally defective individuals, rather than a capacity that we all possess. To ask other readers questions about Why We Snap, please sign up. One thing about reading a book with a bold orange and yellow dust cover, with the title "Why We Snap: Understanding the Rage Circuit in Your Brain", is that it made me a bit uncomfortable about what sort of person I looked like. I have to admit that if I came upon such a person in public, I might up my estimate of their likelihood to have anger management issues. But, you know, don't judge a book by its cover and so forth. In fact, in this case, don't even judge a book by its title, because most One thing about reading a book with a bold orange and yellow dust cover, with the title "Why We Snap: Understanding the Rage Circuit in Your Brain", is that it made me a bit uncomfortable about what sort of person I looked like. I have to admit that if I came upon such a person in public, I might up my estimate of their likelihood to have anger management issues. But, you know, don't judge a book by its cover and so forth. In fact, in this case, don't even judge a book by its title, because most of the books is not (directly) related to anger. It starts there, and ends there, but most of the middle is about all those parts of your brain that are at work out of your conscious awareness. Because, in many or perhaps most cases, that's where anger comes from, which is why its arrival can be as surprising and unexpected to the person who is angry, as to anyone else. In some respect its more like a sneeze than it is like a thought. For the most part, I found Fields' explanations credible and informative, although I have not enough independent knowledge of brain science or psychology to really evaluate them. His writing, I can say, was good enough to keep my attention, and he knows how to move between personal anecdote and scientific study (sprinkled with latin names for brain regions) in the right frequency. Fields also does a pretty good job of weaving interviews with others into the book. For example, discussions with Navy SEALS, or a blind woman who can "see" colors in photographs by feel, or people who engage in BASE jumping, or people who engage in self-cutting behavior. They all, one one way or another, help us to understand how the nonconscious parts of our brain behave, and why they can be invaluable or destructive. One thing that made a few parts of the book a bit slower for me is that he spent a good deal of time attempting to convince the reader that it is possible for an emotion as visceral and powerful as anger to arrive, fully formed, on an unsuspecting conscious that is not (even afterwards) really aware of where it came from or why. I, on the other hand, was already quite convinced that most people rationalize their emotions after the fact, attempting to concoct a story of where they came from that will sound convincing to others, or at least to themselves. So some of this was, for me, a bit unnecessary. But, for people who still like to tell themselves a story about why they had the emotion they had, and are uncomfortable with the idea that different parts of their own brain might be unaware of the true motivations of other parts of their brain, so for them this might be important to spend some time on. The book is intended as a ‘grand unifying theory’ of human aggression (rage), along with some suggestions on how to manage it, with a particular emphasis on when people snap in an instant. For me, it didn’t get 100% of the way there, but it’s a fascinating ride. Strengths: (Sometimes) doesn’t let the facts get in the way of a good story. Makes the argument that rage (snapping) is a biological imperative, driven by series of trigge The book is intended as a ‘grand unifying theory’ of human aggression (rage), along with some suggestions on how to manage it, with a particular emphasis on when people snap in an instant. Makes the argument that rage (snapping) is a biological imperative, driven by series of triggers (LIFEMORTS) and that there is evolutionary and neurological evidence to support this. Other than a few points where he veers off-topic, I think he does a good job on this side. He introduces a lot of cool animal and neuropsychological studies, and backs it up with a lot of stories about humans taken from the news. He also has some general neuropsychology which is pretty interesting (I thought his observations about rhythm, and (separately) human knowledge were gold). It’s also well written. His chapter on war and terrorism is poetic and dreadful. Weaknesses: (Sometimes) doesn’t let the facts get in the way of a good story. Throws a lot of interesting observations at us, but has very little scientific evidence about humans. Surely there must be some actual evidence from psychology or anthropology that could help more than using stories from the news? Uses online forums as an example of the sort of advice given to people to manage anger. I would have thought there would be some actual evidence he could throw at the problem from psychology. His solution seems to be to say ‘oops this is evolution’ and to cool off. Maybe it works, but it seems like his assertion could do with empirical investigation. Doesn’t seem to address the role of individual learning or culture, which seems a fairly massive omission. Despite his failure to heed the existing literature (I presume it’s there), I acknowledge this is quite a high standard to set. If he can be critiqued for not considering psychology and anthropology, then those disciplines can be critiqued for not considering the evidence he brought to the table. I think the evolutionary/ paleo perspective reminds us that humans are an animal, and (should) open up worthwhile scientific discussion. While he doesn’t heed the existing literature, he has made a worthwhile extension to it. Hopefully this leads to further worthwhile investigation of such a fascinating topic. Overall, a fascinating cornucopia. Maybe not quite the GUT of violence, but a fascinating contribution. This is an excellent book about brain circuitry and how we can just SNAP. The anecdotes are engaging particularly the ones that the author experienced himself. I would like to re-read this book sometime. I listened to it driving and I am afraid I may have missed some important content. The threats that lead to snap follow an acronym called LIFE MORTS. This is something I am glad to know about. Stop: being tra This is an excellent book about brain circuitry and how we can just SNAP. The anecdotes are engaging particularly the ones that the author experienced himself. Everyone should read this book. This scientist's research helps to explain the mass shootings and violent outbursts against each other that have been rampant in the news lately. Our brains are hardwired for snapping, and he lists 9 major trigger points that set us off, and how they make sense from an evolutionary perspective, but just don't fit in our modern society today. Great stories interwoven with research. This is a great book if you want to understand why we "snap". The author skillfully uses personal stories to explain how rage is triggered, when, and how to channel it appropriately. Loved the acronym, LIFEMORT. Loved the description of the unconscious because I use my sub-conscious to solve problems (particularly when I write). Dr. Field’s book validated my experience. I am surprised at the blind woman who could see tactilely. This book is amazing – BUT – the chapter “A World of Trouble” was a major turn-off for me. Suddenly the tone of the book changed from awe inspiring, scientifically informative into a diatribe regarding evil humans. I found the transition to be shockin Loved the acronym, LIFEMORT. Loved the description of the unconscious because I use my sub-conscious to solve problems (particularly when I write). Dr. Field’s book validated my experience. I am surprised at the blind woman who could see tactilely. This book is amazing – BUT – the chapter “A World of Trouble” was a major turn-off for me. Suddenly the tone of the book changed from awe inspiring, scientifically informative into a diatribe regarding evil humans. I found the transition to be shocking; a Dr. Jekyll, Mr. Hyde thing. Icky. It was overly done. I’m very intrigued with the authors’ comments about brain functioning regarding love, altruism, meditation and spiritual faith. Also fear. Very much enjoyed the Navy Seals, downhill skiing and the gut/intuitive “knowledge” that results in a decision that saves lives. Wow-factor here. I’ll be pondering these things more. I enjoyed his comments regarding H.G. Wells and Mahatma Gandhi. I liked the chapters “A Community Without Rage” and “Change” because these chapters are hopeful and they make sense. This powerful book makes me question the value of psychology. Instead, I think I like this alternative view that explains a lot of what’s happening biologically. Can we choose? In many cases we can choose. It’s thought provoking and in-depth. I learned a lot about brain functioning. A palm slap to my forehead, “Ah, THAT what’s happening!” I can make other choices now: Maybe use another communication paradigm. Or step back and observe what is happening in an event with a probability attached to it. Things like that. This is a good read. A “keeper” in my personal library because it’s a book I will reference many times. Fields provided an explanation for aggression and violent behavior from a neurobiological perspective. He describes nine environmental triggers for violence in spousal relationships and societies that impinge on human conditions causing the brain circuitry to malfunction. Fields uses a mugging he suffered in Barcelona, anecdotal incidents, and research to carry his story. He does well in providing an understanding of violence, which is the purpose of the book. I hope though it is not taken as an Fields provided an explanation for aggression and violent behavior from a neurobiological perspective. He describes nine environmental triggers for violence in spousal relationships and societies that impinge on human conditions causing the brain circuitry to malfunction. Fields uses a mugging he suffered in Barcelona, anecdotal incidents, and research to carry his story. He does well in providing an understanding of violence, which is the purpose of the book. I hope though it is not taken as an excuse for violence. Many people have faced significant threats and have not reverted to violence. Honestly, this book is a wonderful read for any person. I almost wish it were required reading for every person in late high school-- at least several chapters of it. I never finished the book in full, but read enough to have an educated opinion on it and understand the bulk of its purpose for being written. I can say with conviction that I have been better able to control my anger and am much more capable of controlling those "rage" snaps that sometimes overcome people. My only con, as you migh Honestly, this book is a wonderful read for any person. I almost wish it were required reading for every person in late high school-- at least several chapters of it. I never finished the book in full, but read enough to have an educated opinion on it and understand the bulk of its purpose for being written. I can say with conviction that I have been better able to control my anger and am much more capable of controlling those "rage" snaps that sometimes overcome people. This book was much better than I thought it would be. I expected a kind of "Self-Help Book, " and honestly they don't present the idea and content of the book well. While I loved it, there were a lot of digressions within digressions, and after a while, I had felt like it was work to finish it. I kind of wanted the author to get to the goddamn point already. Don't let this deter you, although the author rambles like I do when I'm speaking to someone at a cocktail party, this is still a worthwhile This book was much better than I thought it would be. I expected a kind of "Self-Help Book, " and honestly they don't present the idea and content of the book well. Interesting book. I didn't exactly read the thing, as much as skim to parts I thought were interesting to me. It wasn't a light read, but really wanted to learn a bit about rage. Fields covered the subject pretty well, I'm guessing as I am no expert on brain circuitry. But the stories made a fascinating read and I am sure others will enjoy the book very much, as well. Some of the other chapters are good, some should be deleted. Overall I found this book to be fascinating. There are some very interesting revelations to be had within the pages of this work. I did however, have two issues with the book. First, the continual return to author's encounter in Italy, felt over-used. If you have lived a life sheltered from the realities of violence this might be fascinating. In the end his need to apologize or even feel shame at his actions seemed forced. Second, his views on criminality and especially domestic violence were wo Overall I found this book to be fascinating. There are some very interesting revelations to be had within the pages of this work. I did however, have two issues with the book. Second, his views on criminality and especially domestic violence were woefully naive. I have never seen an abuser who felt remorse for their actions. Their regret solely tends to center around the fact that they are in trouble. Often more time is spent blaming the victim for their actions. Super interesting well written book about the biological brain circuits that are related to rage, the triggers, the responses and the way to avoid snapping reaction. It's the first time that I read such an interesting book about this argument and there are many food for thoughts. Libro veramente molto interessante e ben scritto che correla situazioni a circuiti celebrali e ci fa vedere o almeno prova, come la rabbia a volte possa essere utilizzata a proprio favore piuttosto che subita anche da ag Super interesting well written book about the biological brain circuits that are related to rage, the triggers, the responses and the way to avoid snapping reaction. It's the first time that I read such an interesting book about this argument and there are many food for thoughts. Libro veramente molto interessante e ben scritto che correla situazioni a circuiti celebrali e ci fa vedere o almeno prova, come la rabbia a volte possa essere utilizzata a proprio favore piuttosto che subita anche da agente. È la prima volta che mi capita di leggere un libro cosí onnicomprensivo sull'argomento e che offra cosí tanti spunti di riflessione. Listened to this book: completely mis-titled, poorly dubbed, confusingly organized; interesting anecdotes. When is the last time you were piping hot? What triggered your anger? (2) LIFEMORTS: insult; family; environment; mate; order in society; resources; tribe; stopped.